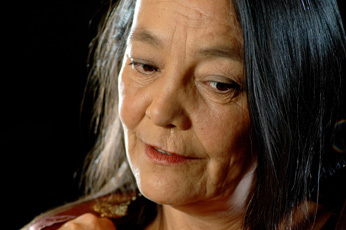 Tantoo Cardinal (Metis) is one of the most renowned Indigenous actors in the world. Throughout her acting career Tantoo has done much to minimize the inaccuracies and stereotypical portrayals of Indigenous people that tend to infect mainstream media, bringing instead genuine warmth and understanding to her very human characters. The confines of acting in someone else’s story have lead Tantoo to take the courageous step of writing her own stories, and she has remembered what it was she wanted to do before acting just “came along”. We watch and listen as Tantoo reads from a short story she has written. . It is moving, funny and passionate writing, and easily conjures the images, sounds, textures and flow of the story in the mind’s eye of the listener. It is visual storytelling. This entry was posted in Make No Bones Shows and tagged Connecting with Spirit, First Nation, Tantoo Cardinal (Metis). Bookmark the permalink. Finally we recognize the Metis!!! I am looking forward to this show. Thanks much. Posoh! In the first half-hour, IAN ZABARTE is Principal Headman of the Western Bands of the Shoshone Nation. In 2018, he was appointed to the Licensing Support Network Advisory Review Panel of the U.S. Nuclear Regulatory Commission.